Christ: Last Supper – Christ, decorated crossed nimbus, stands (? ), raising wafer in His right hand and chalice in His left hand. In front of the Christ, Evangelist John, nimbed, rests his head on his left hand. 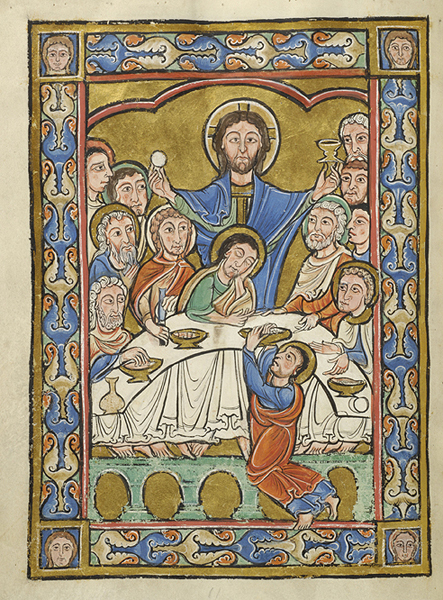 Ten flanking apostles, seven nimbed, sit at draped table laden with vessels, vase, and food; one holds knife. In foreground, Judas, nimbed, holding vessel, kneels before the table. Scene beneath architectural frame, against gold background, within decorated frame, and heads of four women in square corners.